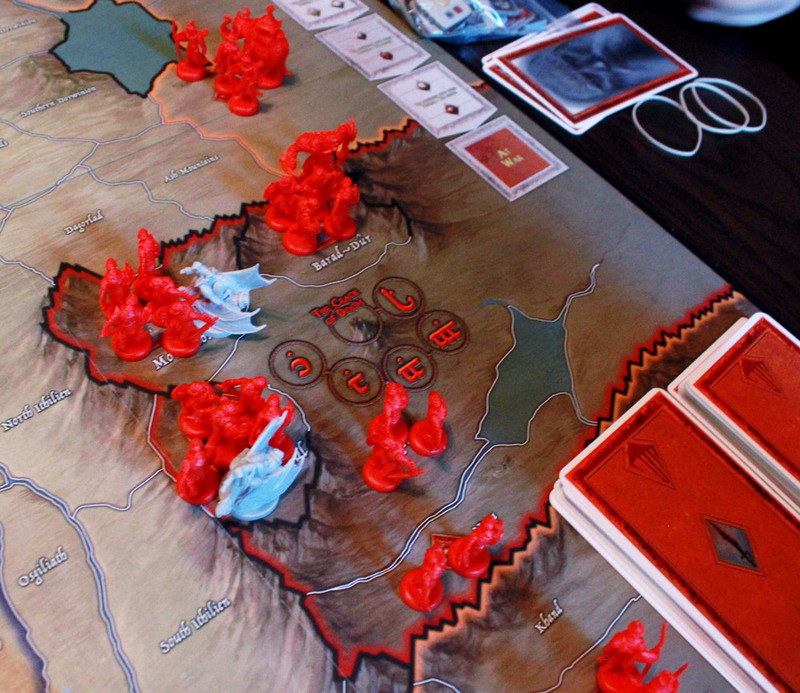 War of the Ring is a wargame of epic proportions, in which the story of Lord of the Rings unfolds in brand new ways. 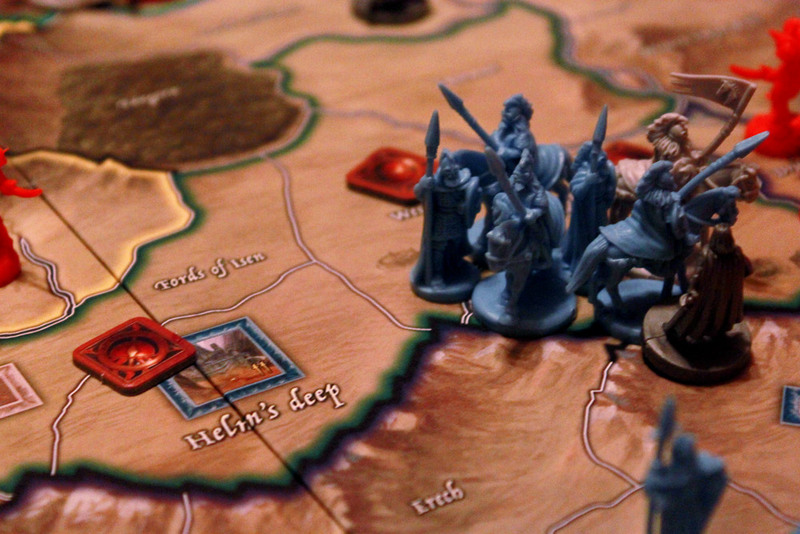 With a lot of strategy and a little bit of luck, 2-4 players can see what might have happened if Boromir went to Fangorn with Gandalf, or Saruman conquered Helms Deep, or Gimli roused the dwarves to war. Taking on a franchise like Lord of the Rings is no small task. Does War of the Ring successfully weave a glorious legend of good versus evil, or does it sink into the river to be forgotten for all time? 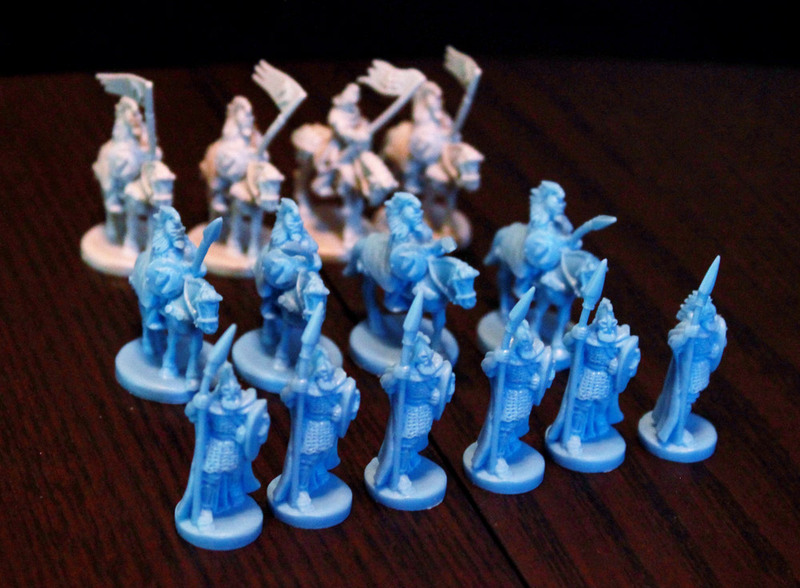 In War of the Ring, one player (or team) takes on the role of the free peoples of Middle-Earth (including Gondor, Rohan, Dwarves, Elves, and men of the North) while the other controls Sauron and his orcs, Saruman with his Uruks, and of course the Easterlings and Southrons. The goal of the Free Peoples is to bring the Fellowship of the Ring into Mordor and cast it into the crack of doom, while the forces of evil are trying to corrupt the Fellowship, thus bringing the ring back into Sauron’s hand. Each side also has the opportunity to win a military victory, scoring points for conquering enemy fortresses and strongholds. The core of the mechanics lie in the Action Dice. Each side has a number of action dice, which they roll at the start of each round. 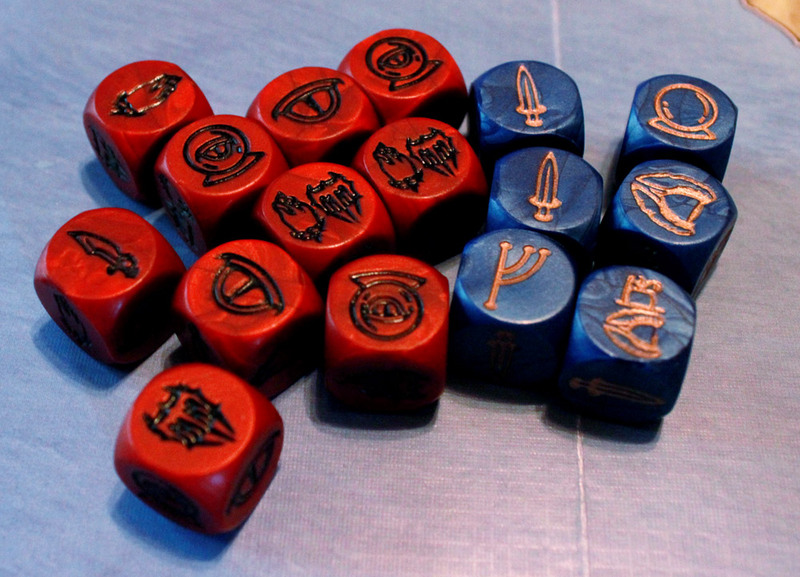 The different sides of the dice correspond to different actions, such as moving armies, recruiting more soldiers, moving the Fellowship, or playing Event cards. Players from each side take turns using one of their action dice to perform a corresponding action until all dice are used up. 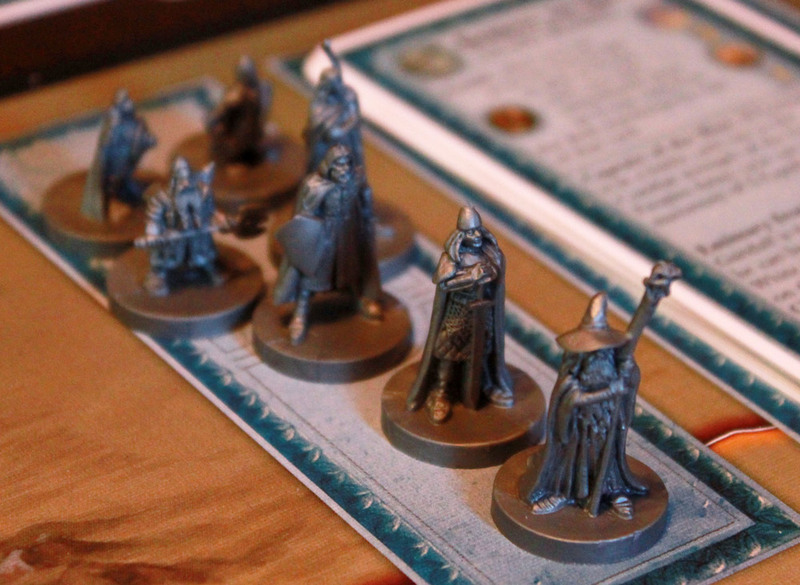 As the game progresses, players also have the opportunity to unlock additional action dice by bringing new characters into play, such as Gandalf the White, or Saruman. Combat is dice-based, with players simultaneously rolling regular 6-sided dice based on the size of their army, scoring hits on rolls of 5’s and 6’s. Cards supplement this by adding 1 or 2 to your dice rolls, allowing pre-combat rolls, and other effects. In addition, fighting from a Fortress or Stronghold present additional defensive bonuses. There is also a political track representing the state of each Nation and their interest in the War. Nations are limited in movement and attack options until they are actively At War, and may advanced along the track when characters come to influence them, when they are attacked, or when certain cards are played. Each team must balance their use of military with attention to the Fellowship, the Free Peoples attempting to advance them into Mordor and the forces of Evil attempting to find them and Corrupt them. The two sides play differently both regarding the Fellowship and Military actions. The Free Peoples are fighting a losing battle; essentially trying to hold out until the Fellowship makes it in. They will generally be fighting from a defensive position, within strongholds and fortresses; but their reinforcements are limited and when they run out, they run out. Their cards boost their attack and striking ability, and they also have the characters from the Fellowship – Gandalf, Strider, Legolas, Gimli, etc. – which they can choose to break off to join in battles or rouse allies or other particular actions. 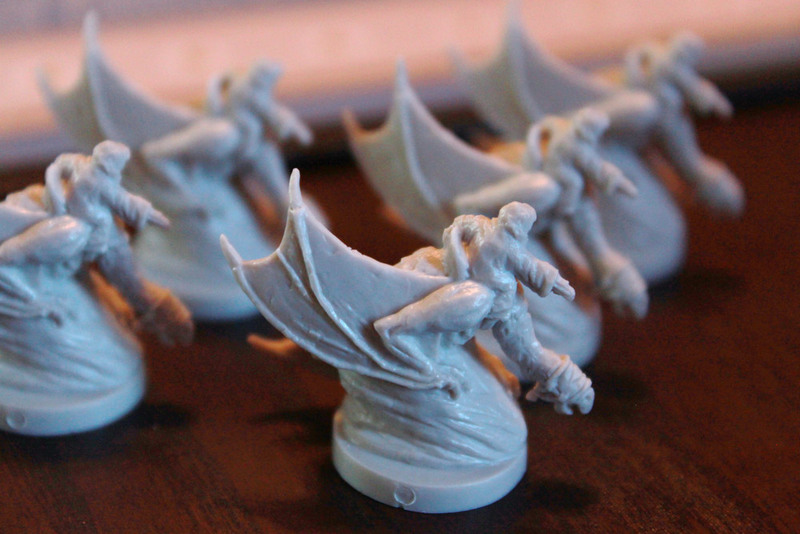 Evil has the advantage of overwhelming forces, with unlimited reinforcements and a greater number of Action dice. They can afford to lose units and many of their cards greatly increase combat effectiveness for both sides, or allow the sacrificing of troops for stronger bonuses to the leftovers. However they will generally be fighting without the protection of fortresses and strongholds. In addition, Evil cannot focus too much on war, or it will be quite easy for the Fellowship to slip into Mordor unnoticed. The game ends immediately if the Fellowship becomes fully corrupted, or if it reaches the Crack of Doom. It ends at the end of a round if the Free Peoples control 4pts worth of enemy cities, or the Evil nations control 10pts worth of enemy cities. But… is it fun to play? 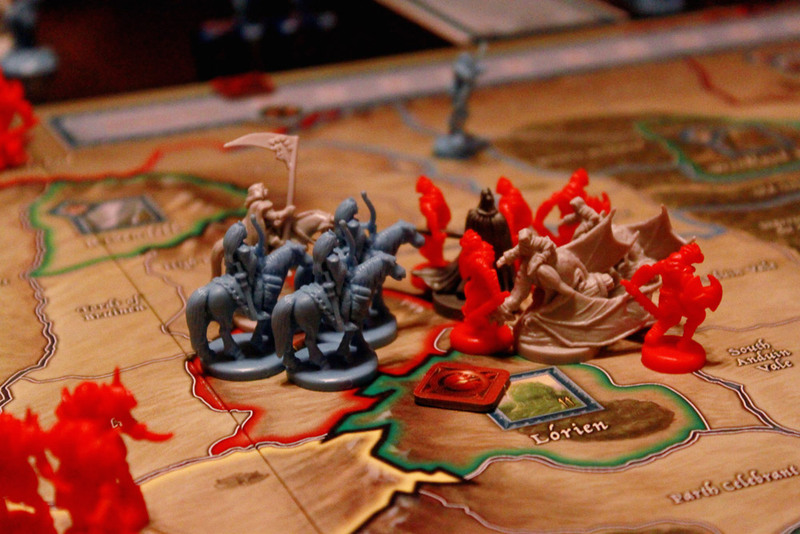 Let me get this right out before we move on, but please don’t run away right off: yes, War of the Ring is a lengthy, complex, strategic, heavily dice based war game. But (you didn’t run away, right?) it’s also so much more than that. Yes, the game lasts 2-4hrs (4 is pretty much the long-end extreme, and you’ll normally get about 3 hours out of it). But if you think about it, that’s about the length of one Lord of the Rings movie. Just one, not even the whole trilogy. And in that same time period, you build an entire epic tale all on your own – a tale that has the essence of Lord of the Rings, it has all the characters, but it truly becomes your own. And that’s what’s really enjoyable about this game. So if you’re not a Lord of the Rings fan, or if you’re an extreme purist that thinks the books exactly the way they are are the only proper way to experience Lord of the Rings, you might want to stay away. Good luck getting into Mordor, at least with an Army. But even though there’s a wargame going on underneath it all, and you may have good or bad luck through your dice rolls, it is brilliant fun watching your own War of the Ring play out on its own. What would happen if Boromir and Gandalf went to Fangorn? What if Saruman took Helms Deep before Theoden had a chance to get there with his army? What if Strider left Rivendell separately from the Fellowship and went straight to Gondor’s aide? There are so many possibilities, so many ways the game can play out. You can try to reproduce exactly what happened in the books if you like, or you can try something completely different. Despite the dice-based combat, I think you win or lose the game almost entirely based on your choices. More important than rolling a bunch of sixes, or rolling all the right actions that you need, is using the actions you have to their highest potential, bringing troops to the right place at the right time, and playing your cards wisely. Each card has a powerful effect that can be used as an Action, or a battle effect that can be used in combat – so you have to pick and choose which benefit you’re actually going to get. Certain battle effects may be tempting, but they may be much more effective as the Action or even a different battle, even if that means sacrificing a few troops or even losing a whole battle without it. Rohans very limited reinforcements pool. I love the balance between the different features of the game. You’re not stuck with just military maneuvering; you also have characters to utilize and the Fellowship to worry about, not to mention the political track. You have to effectively divide your attention between those three, and it’s definitely enjoyable and not tedious to do so. The rulebook is quite hefty and there’s a lot of detail, but the game does include pretty helpful player aid sheets that list all the possible actions you can do with your dice, and a number of other useful reminders of what’s going on and what you’re supposed to be doing. There are some details you’ll need to remember and you may occasionally have to flip through the book to clarify something, but for the most part it plays logically and once it gets going, it makes a whole lot of sense. The hardest thing to remember in my experience is exactly what events and actions caused nations to advance on the political track, but that is easily checked and has some details on the player aid. After the Witch-King conquered Lorien, he went off to recapture Moria. Just like in the books. 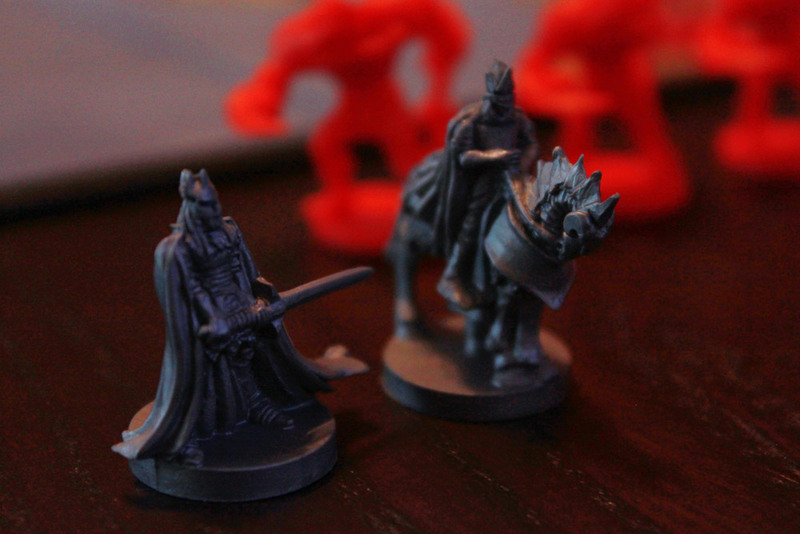 Beware the Witch King and the Mouth of Sauron! The asymmetrical nature of the game is pulled off brilliantly and completely enhances the feeling of the game. The Evil player(s) will definitely feel like they have overwhelming forces; they will feel confident, they will feel like the Free Peoples have no hope and will be crushed underneath their feet. The Free Peoples will feel this overwhelming force. They will feel desperate, they will feel like all is lost, and that there is just no way to continue to defend their cities from the enemy onslaught. But just like the story, it’s all about the ring. And while Evil has all the power of military might, it only takes a small crack for the Fellowship to sneak through. The Free Peoples will find themselves holding on in their last desperate bid for victory as Frodo, Sam, and Gollum take one step at a time towards the Crack of Doom. No matter what happens, both sides will have a fighting chance of winning until the very final moment. It is exciting, it is so very much fun, and it tells a great story along the way. If I have one other major complaint about this game, it’s that I wish the minis were more distinguishable from each other. The box comes with no sort of official dividers or bags or anything, and the minis for each side are all the same color. This means that setup requires a LOT of time separating the minis into their various Nations – and it is important that they be separated. Colorizing the minis (not even detailed painting, by the way) according to the nation’s border color, or even just different shades of blue to make it easy to separate, would have gone a looong way. As it is, we added our own baggies to keep the armies separate in storage, which helps a lot, but it still makes for a lengthy setup time. When you have a mix of experienced and newbie players, you can use the setup time for someone to explain the rules to the newbies, but other than that it’s a hassle. It seems like having different molds for each nation anyways shouldn’t increase the cost too much to use a different color for each mold, but what do I know about such things? Anyways it certainly doesn’t stop my from playing the game. 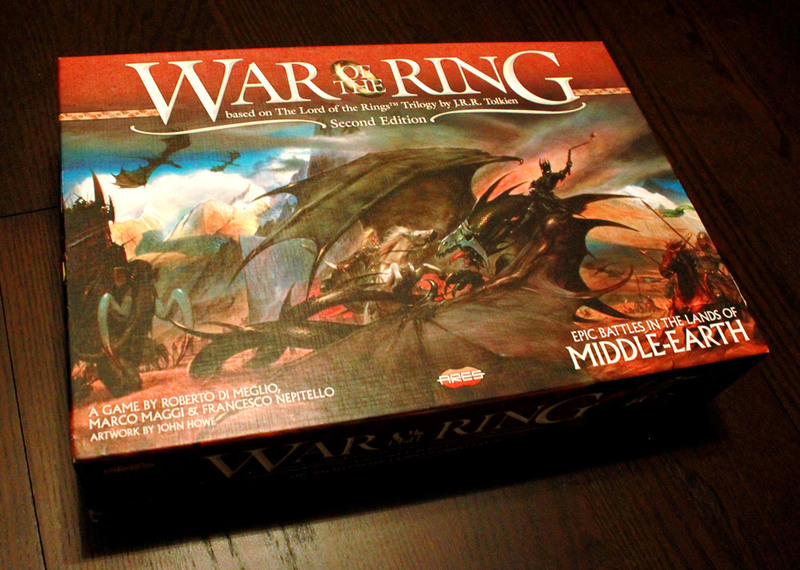 So, final thoughts… War of the Ring is an awesome game. It provides action, strategy, tactics, a bit of luck, and a whole lot of storytelling. It lets you create your own tale as you move characters and armies, and play cards, and watch everything unfold. I wouldn’t recommend playing with 3 players, but with 2 or 4 and a few hours of free time, this game is definitely HIGHLY recommended for Lord of the Rings fans. I can’t say how any of this would feel to someone who could care less or knew nothing about Lord of the Rings, but as for me, I find it most enjoyable. Next Article Do We Overplay Our Games? possibly there was a misunderstanding of the 3-players rules. 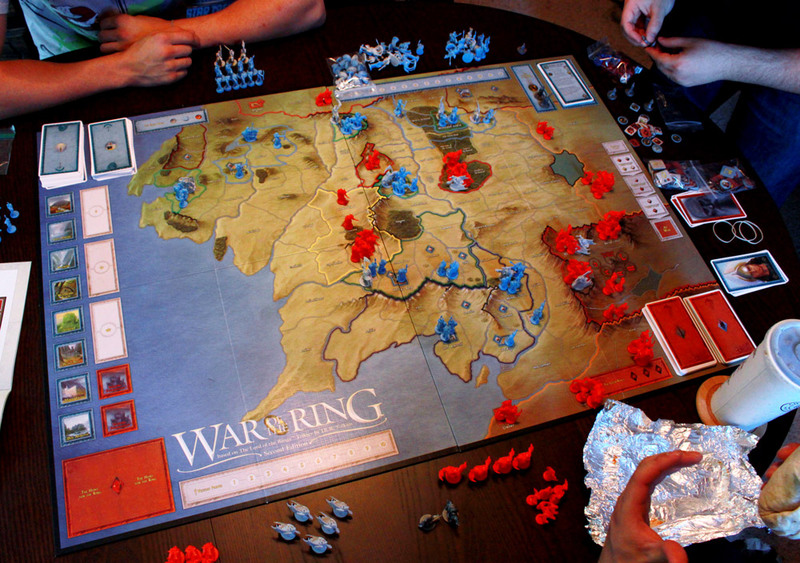 In the three-players game, the lone player MUST alternate between the two “factions” he controls (Gondor/Elves — Rohan/North/Dwarves). So he plays much the same as the two players side must, except that he only has one hand of cards to manage, instead of two. So there’s an advantage, but not as much as it could appear by reading this review. Oh man! Thanks for the tip. I missed that rule, that does make a big difference!